I remember a time in my life when TIME was particularly frustrating. TIME ticked away on a house that we really needed to sell. TIME meant money, as we paid a house payment for an empty house. It meant being unsettled, because over half of our stuff was in storage as we rented in our new location. Of course, even though I’d like to place a dark cape and a mask on TIME, that’s not where the problem is. TIME … and the ticking down of it … isn’t something I need to fight against. Instead, as God’s been revealing to me lately, TIME is a tool in His hand that is used to reveal what is really in my heart. Mostly, misplaced security. God opened my eyes to this by leading me to Psalm 30:15. “My times are in your hands,” David said. God is in control of TIME. Of all the events that seem to take way too long. I needed to hear that. Some lessons can only be learned over time … and discovering the truth what is in my heart is one of them. If our house had sold right away, and we’d moved into a nice place in our new city, I never would have realized how much trust I’m placing in things more than God. God has also reminded me lately that He lives outside of TIME. What seems to take forever I my eyes is just a blink of an eye to Him. TIME may feels like it’s throwing me punches, but instead it’s a tool that God’s using to mold and shape me. So even though the clock is still ticking, I’m realizing more and more that God can be trusted all TIMES. He’s my security. And TIME isn’t an enemy when its in God’s hands. TIME is a tool. Lord, mold me through the tick, tick, tock. 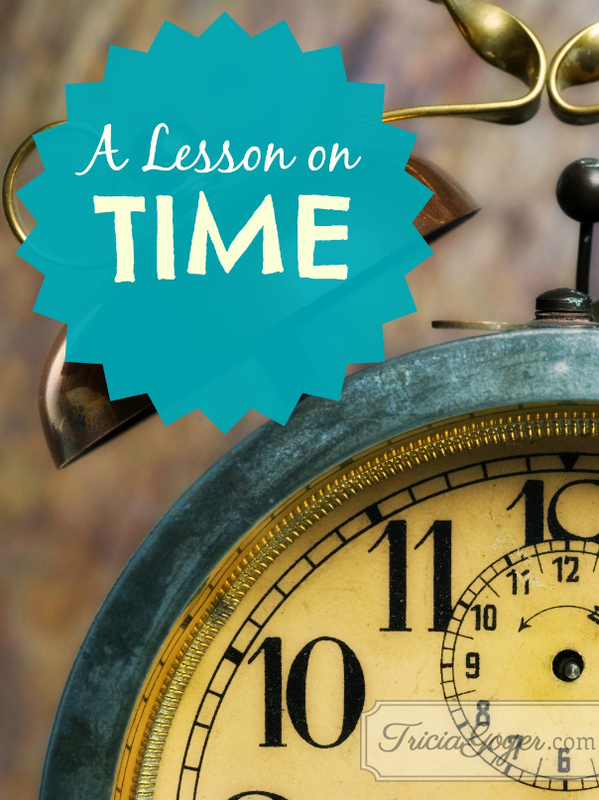 Pinpoint what is at the root of your frustration with time. Is it money, the unknown, insecurity, lack of faith? Surrender your requests to God, knowing he is in control of time. Wait patiently for God’s time, remembering to look for what God is teaching you. I like to be in control and know what is going to happen next. Help me release that control to you and trust your perfect timing. May I catch myself in those moments when I start whining and complaining when it comes to waiting. Instead, help me take a deeper look at what you are teaching me. Continue to mold me and shape me into the person you made me to be … no matter how long that takes! Great post. Our concept of time is so objective and God’s is not. Thank you for the encouragement to look at it differently and be obedient to its Creator! I was reading this and thinking I needed to share it with my husband (since he goes through the same frustrating circles about our own home). I kept reading and realized that despite my relaxed nature, I do this to. Only, I want God to do it now without my having to change my own actions. So, I will quit trying to get my husband to relax in his journey and concentrate on making the most of the time in my journey. Thanks for the focus. I’m glad my words were a blessing to you, Kathryn!